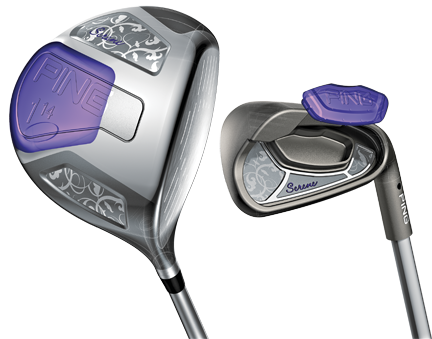 Ping Golf has announced new products for 2013 and while most of the attention will be focused on their first adjustable driver, the Anser, the company also has a complete update of ladies clubs under the Serene model name. The fairways (SRP$220-$199 street) are stainless steel and also have longer shafts standard. The head has an external weight pad with the center of gravity back and slightly lower to produce high launch and increase the MOI in both axes. With the center of gravity a little higher, the Serene fairways have the tendency to produce moderate spin meaning more carry distance and roll. Serene irons come in a mixed iron/hybrid set, women can blend 4H (22°), 5H (26°) and 6H (30°) hybrids with perimeter-weighted 17-4 stainless steel irons (5-9, PW, SW & LW). Irons feature a low center of gravity and perimeter weighting and the traditionally shaped hybrids are larger with the center of gravity back and lower for high launch with moderate spin. 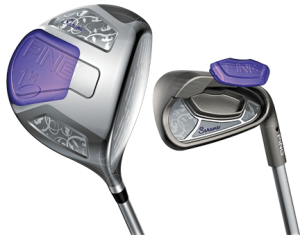 Street prices for irons are $106 and Serene hybrids are $169.